Measure bolt tension to determine optimal torque. Ideal for design and engineering. The tension is directly measured while the bolt is tightened. The optimum tightening torque can be determined. By combining the meter with the torque wrench, the meter is used for various applications, such as measurements of bolt strength and torque coefficient, etc. 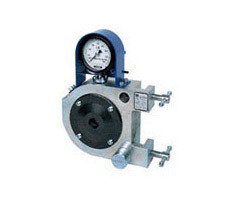 The hydraulic system meter is very durable and robust instrument. Since the shock absorber has been assembled in the hydraulic circuit, it is available for impact and impulse wrenches. One set of bushings and plates are supplied as standard accessory to adapt to standard test bolts. BTM400K is a compact and portable meter, especially designed for tension verification test of torsia type high tension bolts in the construction field. High strength hexagon bolts for friction grip joints are used in the table above. Plates, bushings, spanner for plate, bolts for plates are supplied as standard accessory. Bushing and plate sets for M22 and M24 torsia bolts are supplied as standard accessories. Other bushing and plate sets are supplied on request.